What Does Code P1166 Mean? For best performance, fuel economy, and emissions, the engine needs to balance air-fuel ratio (AFR) with varying operating conditions, which can depend on driver demand, engine temperature, and engine load, to name a few. The engine control module (ECM) uses a feedback control loop to monitor how much fuel is being utilized by the engine at any given time. Ideal gasoline combustion, the stoichiometric ratio, is 14.7:1 air to fuel, which should leave no oxygen in the resulting exhaust gases. Because the real world isn’t ideal, the ECM uses oxygen sensors or air fuel ratio sensors to detect the amount of oxygen in the exhaust stream using this information to modulate fuel trim, maintaining the most appropriate AFR. 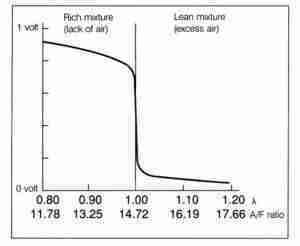 AFR Sensors function similar to Oxygen Sensors, except usually on a 5 V scale. Modern AFR sensors, also referred to as heated oxygen sensors, Lambda sensors, or wide-band oxygen sensors, depend on temperature for proper function, typically upwards of 600 °F. Exhaust heat does it, albeit slowly, so the ECM runs the engine in less-efficient open loop mode. Built-in heater coils get the AFR sensor up to operating temperature faster, which reduces open-loop emissions and improves engine operation. Depending on the vehicle, the ECM may monitor heater circuit feedback or expect a valid AFR signal after certain conditions are met, usually time and temperature. If the ECM detects insufficient feedback voltage from the heater circuit or it takes too long to get an AFR signal, it calculates this as a problem with the heater circuit, setting a diagnostic trouble code (DTC) and illuminating the check engine light (CEL). For Honda and Acura vehicles, DTC P1166 is defined as “Air/Fuel Ratio Sensor 1 Heater Circuit Malfunction.” Because P1 codes are manufacturer-specific, DTC P1166 may refer to something else entirely on another make. Where is the P1166 sensor located? While the AFR sensors are located in the exhaust manifold or just before the catalytic converter, the connector locations can vary, but they’re not usually buried too deep. Fuses and relays are usually conveniently located in fuse and relay boxes under the hood. What are the common causes of code P1166? Depending on year, make, and model, DTC P1166 may have number of causes. Here are some of the most common. Open Heater Circuit – This is the most-common problem with the AFR sensor heater, especially in high-mileage vehicles. Like all heater coils and incandescent bulbs, the filament can burn out. Oxidation can break the fine heater coil windings. Damage can also break the circuit, particularly on exposed sensors under the vehicle. Fuse and Relay Problems – If the fuse is blown, that will prevent power from getting to the AFR sensor heater. Relays can be tricky, because arcing can lead to pitting and corrosion. When in doubt, try swapping similar relays and see if the problem follows the relay. Don’t forget there are two circuits in the relay, and a failure in either the control circuit or the load circuit can lead to this fault. How expensive is it to fix code P1166? Fixing DTC P1166 doesn’t usually cost more than a new AFR sensor, between $75 and $300, depending on YMM and sensor. Cheaper isn’t always better, though. The cheapest repairs range between $5 and $50, depending on if the fault is a fuse, relay, or wire repair. What are the symptoms of code P1166? The CEL is usually the only indication you’ll have that there’s a problem with the AFR sensor heater circuit. If you pay attention to your fuel economy, you’d likely notice a distinct drop in your miles per gallon. Of course, if you tried to get your emissions inspection, it would fail for the DTC and for excess emissions, most likely high unburned hydrocarbon (HC) content. What are common solutions to code P1166? The typical solution is to replace the AFR sensor or repair the heater circuit wiring in the vehicle. How serious is code P1166? The car will run with this DTC, and you might not even notice any difference. 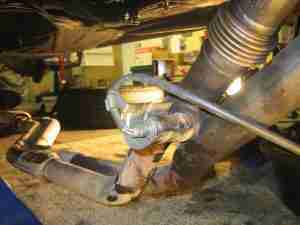 In rare cases, this could cause expensive catalytic converter damage. How safe is it to still drive the car with code P1166? The car is generally safe to drive with an AFR problem, though it will get worse fuel economy and generate higher emissions. Worst-case scenario might include catalytic converter burnout if the engine runs too rich for too long. How difficult is it to repair code P1166? Most AFR sensors, fuses, and relays are easy to access, though the ECM may not be. Circuit testing will require at least a DMM and EWD and some basic electrical knowledge. What are the common mistakes when repairing code P1166? Don’t simply replace the AFR sensor “because it’s an AFR sensor code.” Heater failure in the sensor is common, but it’s not the only fault. Be sure to check the rest of the heater circuit before condemning the AFR sensor. How do you troubleshoot code P1166? To diagnose DTC P1166, you’ll need the electrical wiring diagram (EWD) – bonus if you have a repair manual – for your vehicle, digital multimeter (DMM), and back-probes. Back-probing a live circuit is preferable to piercing the insulation, because this can lead to future corrosion. There are two basic steps to determine the cause of this problem, checking the circuit and checking the heater. To check the heater, disconnect the AFR sensor connector and measure the resistance of the heater circuit. If you have the repair manual, compare your measurement to the listed specification. Typical AFR heater circuits can range from 7 Ω to 20 Ω. If you don’t have the exact specification, you can consider an open circuit to be a fault, if your DMM reads OL or ∞Ω. To check the circuit, with the AFR connected and the engine running, clamp the negative probe to ground and back-probe the heater circuit at the connector. One side should read constant or pulsed 12 V, and the other should read near 0 V, indicating all voltage has been used by the heater coils. If there is no 12 V, this indicates a problem with the power supply, related to a fuse, relay, or wiring. If you measure 12 V on both sides, this indicates a problem with the ground circuit, related to the wiring between the AFR sensor and the ECM. Depending on the nature of the fault, repair might be as simple as a fuse, relay, or AFR sensor replacement. Wiring repair may be required, and ECM faults, though rare, aren’t unheard-of. Most Heater Circuit DTCs relating to Heated Oxygen Sensors (HO2S) and Air-Fuel Ratio (AFR) sensors can be diagnosed the same way.